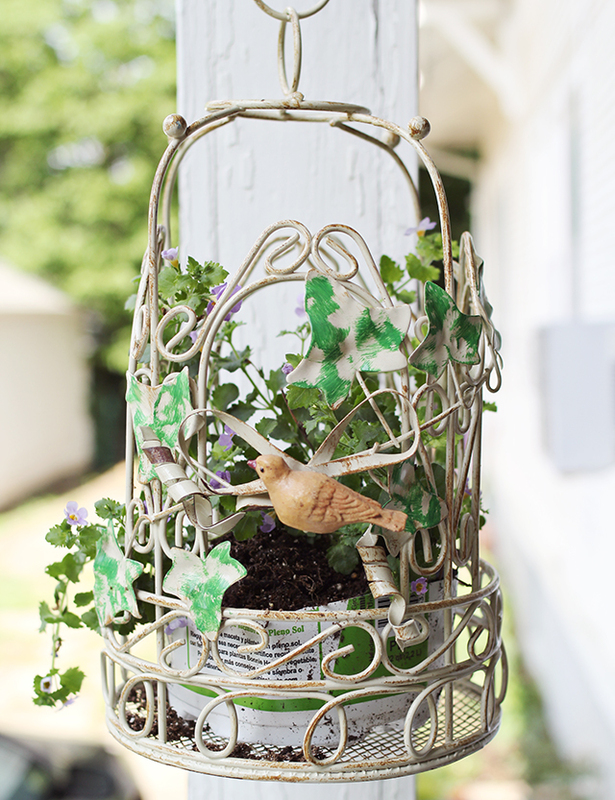 I have a lot of these smaller vintage bird cages tucked in corners around my home. When I found this bird cage this weekend, my first thought was to leave it behind because HOW MANY bird cages does one person really need around their house??? I continued to stare at it... it was just so cute and so cheap, I wanted it to have a purpose. Then I thought of one. Duh. Plants. Right now my brain should go straight to plants. I've been spending enough time on/with them. We made these plant hangers at work using Elise's tutorial, so after I got the bird cage hung, I made a little companion for purple planty. They became fast friends. Notes on this project: if I were to do this again in the future, I would use a solid color container. From far away you don't really notice the printing on the sides of the plastic container, but in these pictures and up close in real life it is noticeable. 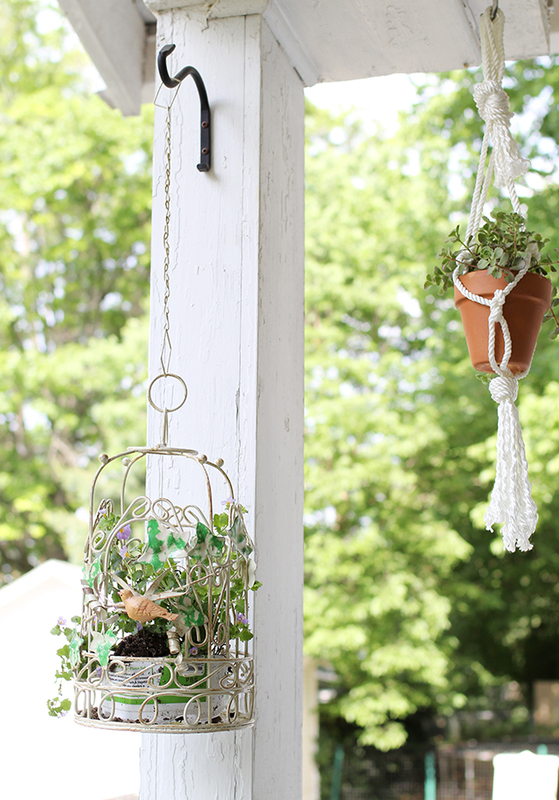 My front porch still needs a little TLC, but these new additions to our plant family are helping dress it up. Now I just need to decide on a paint color so we can do a little painting! What a cute little bird cage! Wishing I had a porch to hang plants from!! 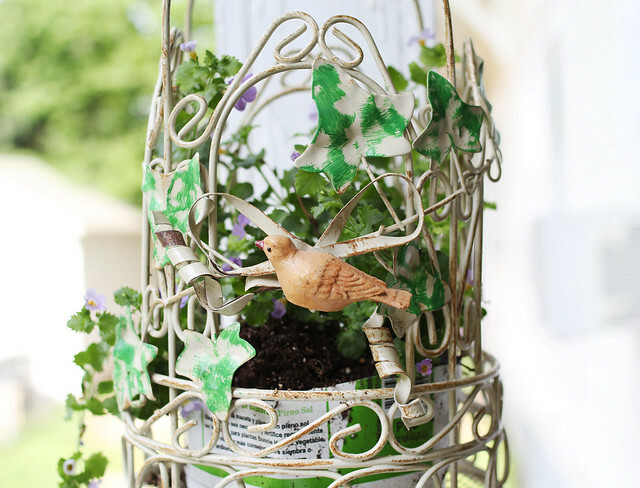 This is such a fun idea, it looks great, I need to start looking out for vintage bird cages! Beautiful! I love old bird cages, they're so pretty, and with the plants inside they're wonderful! I love this! 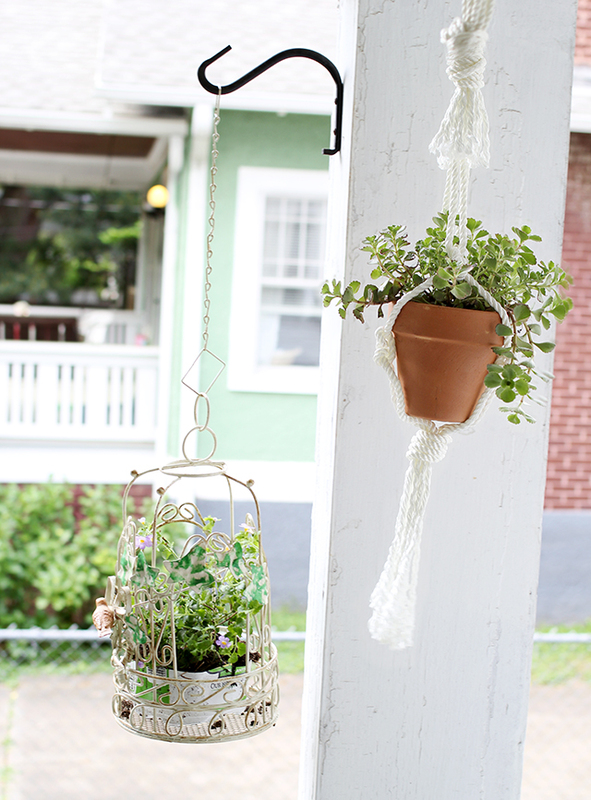 it adds a fun twist to the trending hanging plant. 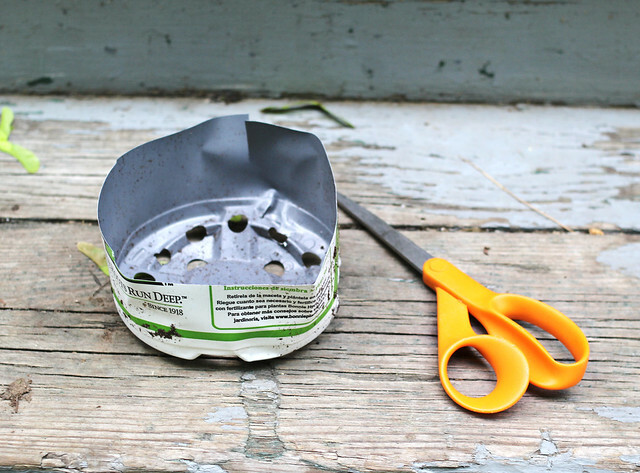 Ahh what a great simple DIY! I've never ever been able to decide what a bird cage is freakin' good for except for holding birds and looking pretty. This is genius though. And I die with that macrame plantter! I remember doing those when I was like 7! That is so pretty and simple! I love it! So cute! If you want a solid color, it's not too late to paint it! I always see birdcages at flea markets but leave them behind since I never know what to do with them. This is a great idea! This is so cute and clever! I wish I had a patio or garden to hang them! ah wonderful! I've been wanting to hang plants in a birdcage, versus a regular pot, but i haven't been able to figure out how. this is great! This is so cute! I love how the plant is going to grow out of the bird cage. Love both ideas! My apartment balcony is in need of some sprucing up and plant life, going to give these a try! So cool! I love birdcages. Oh my god, I have an empty bird cage sitting in my room, just waiting to be filled, and you've just given me the item I've been waiting for. I would have never thought about putting plants in it. Thanks so much! Love it! 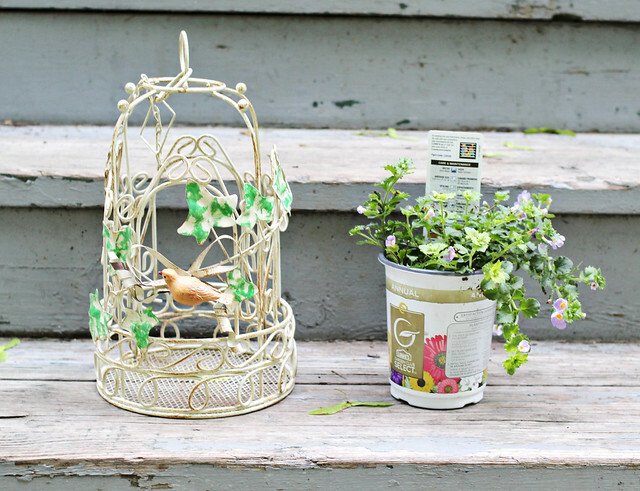 This is such a cute idea, its going to look so pretty when the flowers start growing outside of the birdcage. a few weeks ago, i literally just finished writing and scheduling my post when i went to your website and saw this! What a unique and very pretty idea. I wish I had thought of it. What a great idea! Really wishing I had a porch. This is beautiful! I am so ready for spring! Where did you buy that beautiful bird cage? It's gorgeous!